They say it’s best to strike when the iron is hot, and right now listings along the L train in Northern Brooklyn are red hot with discounts. 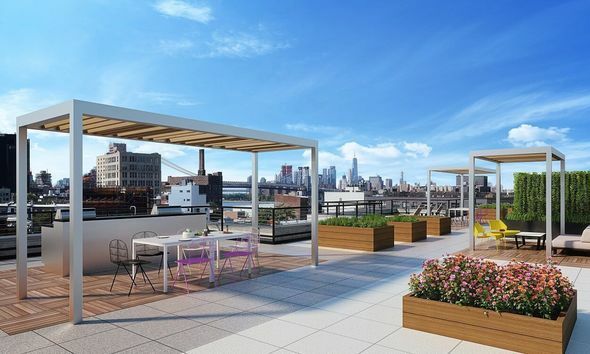 Case in point is this prime Williamsburg studio for $2,475 per month. Located on North 3rd Street just steps from the East River, this luxury unit is a bargain in an area known for sky-high rents and booming new construction along the waterfront. If you’ve ever wanted to live in an amenity-laden building in a trendy neighborhood, this place will check off all the boxes on your list. Built in 2017, House No. 94 is located in the heart of North Williamsburg’s super popular shopping, dining and nightlife strips. The building is surrounded by similar new construction rental towers, but House No. 94 stands out. What really makes the building shine is its communal space. House No. 94 has a gym, lounge with pool table and kitchenette, landscaped roof deck complete with grills, gardening plots, and an interior courtyard with hammocks. Common space aside, the building comes stacked with some pretty sweet amenities, including a full-time doorman, a private gym and a bike room. 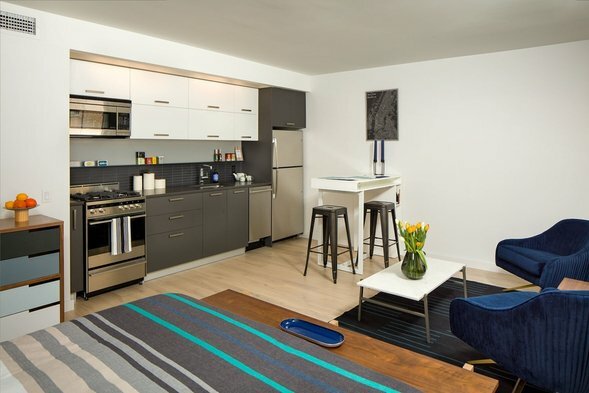 The studio, while compact, has everything needed to live a luxe life on little square footage, including an in-unit washer and dryer. Additionally, the space has central air, new stainless steel appliances, dishwasher, Caesarstone countertops, and soaking tub. Williamsburg rents have started to drop as the L train shutdown looms. That means bargains for those willing to endure a longer commute. 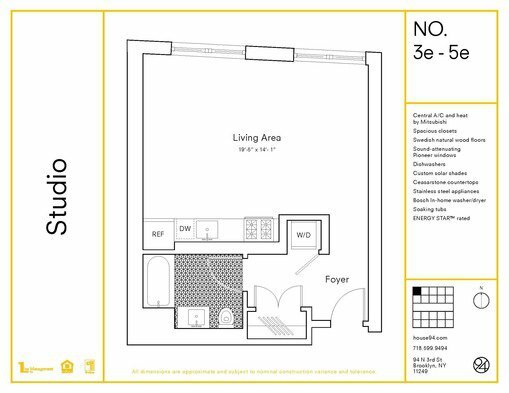 With a one-month free concession, the net-effective rent for this studio comes out to $2,475. Just be sure the net-effective rent isn’t at the top of your budget, as it will likely go up significantly after the lease term ends.This would be an excellent deal for someone who is only looking to stay in the apartment for a year and reap the biggest discount. Even with a gross rent of $2,970, the apartment manages to stay below the median Williamsburg rent of $3,200. Plus there’s no broker’s fee, saving prospective tenants more cash that can be spent exploring the areas hip restaurants and bars. It’s all about location in this city and Williamsburg has that in spades. 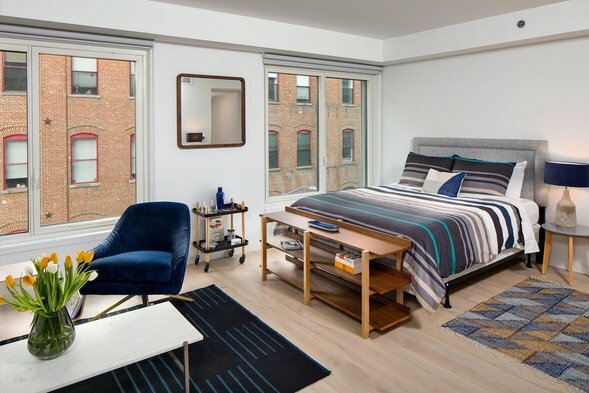 While it is a bit of a bummer this apartment is located off the Bedford Avenue L station, tenants will also have access to two ferry stops as an alternative transit option into Manhattan. 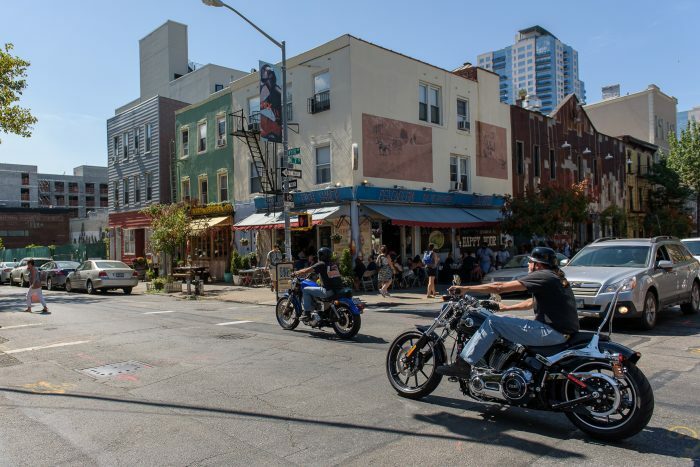 Although the neighborhood has gotten some negative attention because of the L train shutdown and the explosion of hipsters, Williamsburg continues to be a place where New Yorkers want to live. And with good reason. It offers an assortment of trendy bars, restaurants, and event spaces that attract tourists and residents alike looking to see and be seen. And House No. 94 is certainly in the thick of things. Residents are within walking distance to Nitehawk Cinema and Williamsburg Cinema, Whole Foods, Sweet Chick, OddFellows Ice Cream and Music Hall of Williamsburg. While rental concessions are definitely appreciated, they can’t make up for lack of transportation options once the L train shuts down in April 2019. If prospective tenants don’t rely on the L, however, this apartment is definitely a steal.